Coach Sean Payton would have taken 15 yards from the refs for the late push that sent tight end Jimmy Graham rolling onto his knee on the sidelines early in Tampa Bay last Sunday, tearing it up in the process, and reducing him to a pent up stance at the far end of the bench for the remainder of the half. Payton, though in pain, did not miss a beat in handling his duties, yet the sight of him sitting there looking out onto the field beyond a cleared out sideline was a bit bizarre, foretelling a spooky afternoon for the Saints. You had to like it, though, when Coach pumped his arms in celebration while prone on the bench, after a touchdown catch by Marques Colston. In the second half, when Payton had to remain in the locker room and watch the game on television, assistant Joe Vitt assumed the head coach position, mildly reminiscent of the awkwardness when Alexander Haig once told the White House press corps, after an assassination attempt on President Reagan, As of now, I am in control here…. Drew Brees and offensive coordinator Pete Carmichael handled the offensive play calling smoothly, though the 4th and 2 call at under 4 minutes to play was every bit as loathsome to the eyes as a couple of similar situation calls in the opening loss against the Packers. The Saints Eleven have struck out on 4th down thus far this year. Former Saint running back Fred McAfee, somehow at the game in some capacity, shuttled notes in the second half back and forth from Payton in the locker room to coaches on the sidelines, earning this page’s Who ‘Dat Of The Week award. It would have been preferable to connote the award to somebody on the current roster, especially on defense. A cadre of no name, mediocre receivers from the Bucs roamed through the Saints’ secondary all day, as if taking candy from a a baby. ‘Dis was pitiful, embarrassing even. And nobody hardly got within breathing distance of Tampa quarterback Josh Freeman, to decipher if he might need some Lavoris. Toss in a 109 yard rushing day by a Tampa veteran back who hadn’t done as much since 2008, and the Bucs’ offense, which had scored 3 points the previous week, in losing by 45 to the 49’ers, suddenly looked like a well oiled machine. If someone could bottle the antidotes that the Saints have historically provided to opposing players and teams in desperate need of a remedy, they’d make a fortune. Overheard in a coffee shop somehwere in South Louisiana: Yeah, the Saints got their asses kicked, even ‘da coach got knocked out…. What’s with this defense, anyway? On paper it obviously looks a lot better than when the whistle blows. Sure, the Saints committed 4 turnovers (more than LSU has all season), but ‘dat’s no excuse for the defensive backfield resembling green space in an open pasture, or near the end of the game, needing to get the ball back to Brees to have a shot to win it, they allow up-the-gut runs for 10 yards a pop, as if cleared out by a Mack 18 wheeler rolling along over speed limit. It’s not like the players don’t know they are not getting opposing offenses off the field when they really need to either, as several after the game commented and lamented as much. And speaking of turnovers, namely the Saints inability to get any, (they rank 30th in the league in the turnover ratio category), if there were a stat for dropped interceptions, the Saints would lead it. Hopefully as the season rolls along, coordinator Gregg Williams will find some answers (or perhaps a player or two before the pending league trade line), or this could be a long one, keeping a good team mired in mediocrity. The Saints are currently a two loss team, one of nine in the league, no better or worse. They blew a golden opportunity in Tampa to open daylight in their division, which is now a dogfight, and has them in second place. Most disturbingly, though the team has it’s share of resilience, it seems to play up and down to the competition, and lacks a good old fashioned killer instinct, inviting close games. Guys, put some bums to sleep early, so you can get some extra rest! Hopefully, the national pundits won’t start referring to New Orleans’ team as The Big Teasy. Nobody is sadder about Peyton Manning being gone for the year more than the execs on NBC’s Sunday Night Football, who otherwise had a Super Bowl Redux to tout in the Mercedes-Benz Superdome this weekend. Somehow, that name isn’t fluid, as none of these corporate stadium cash-ins are. What about Benzdome? Or SuperMerc? The Colts are one of three winless teams in the league, and are the greatest symbol that football, NFL style, has officially evolved into Quarterback Central. In relief against the Steelers several weeks ago, when young Curtis Painter came in for 39 year old retread Kerry Collins, predictably, passes started falling several yards on the ground in front of Colt receivers, though he made enough plays to keep it close. The Colts have been close in several of their encounters thus far, despite the kill-all-hope handicap under center. We have learned, the hard way, to not underestimate any down-and-out player or team when it comes to forecasting the Saints! New Orleans is a 14 point favorite, which seems risky given that the opposition gets paid to play, too. But the Saints should be up for the game, if only because it is on national TV. As will the Colts…and it’s a treat Saints fans will not have to see the rankest looking uniforms in the league of Jacksonville, Carolina, and Tampa Bay like they have in consecutive weeks. 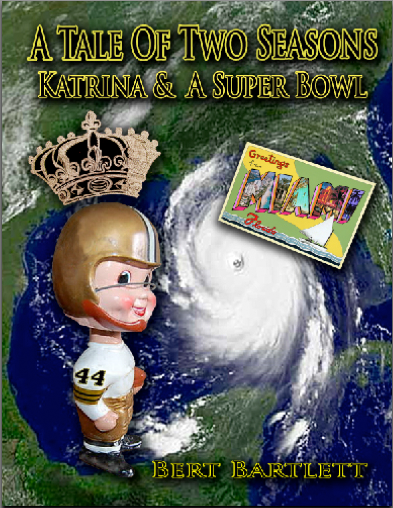 It will be bad news if the home team needs an onsides kick to pull this one out, like a most memorable one in Miami recalled in the link below (yet it would have all been for naught had the Saints not converted it into 7 points). Some doubloon ‘dat ball was! In fact, what is already missed in viewing this play is Sean Payton, coaching from an upright position.